Meteora is a place in Greece, which is unique with its attractive group of rock monasteries (Meteora Monastery). The rock monasteries of Meteora are now an active complex of 7 temples in the central part of the country. Meteora is an amazing place in nature. All monasteries were built with sharp peaks of hard rock, reminiscent of needles. The average altitude of the temple is about 700 meters, with rock massifs towering over the plain of Thessaly. 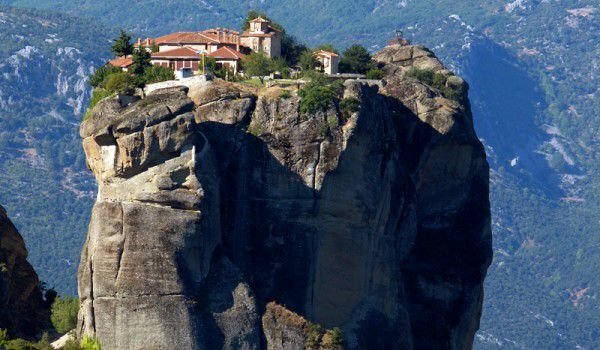 From the Rock Monasteries of Meteora, the Greek city of Larissa is only 70 km to the west. 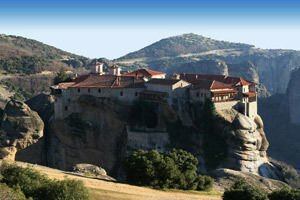 The monastery complex is located 5 kilometers from the village Kalbaka, which in turn stands at 285 km from Thessaloniki and 326 km from the Greek capital Athens. Lining up on the northwestern part of the fertile plain of Thessaly, the rock monasteries of Meteora are exactly at the foot of the Pindos Massif. The popular Chester Bennington states: “They do not resemble anything from this planet", that is absolutely justified. Today, six of the seven operating temples are open for public visits. The incredible beauty of the complex of Meteora was assessed both by contemporary film makers, and the musicians. The Holy Trinity Monastery was elected as a natural setting for the movie "For Your Eyes Only" from the James Bond series and the popular band Linkin Park named one of their albums, "Meteora", after the band members are struck by the magnificence of this place. Today, the rock monasteries of Meteora are part of the list of World Heritage Sites by UNESCO. Today's incredible complex of Meteora evokes admiration and reverence from tourists from around the world, as well as geologists, researchers and historians among themselves. The impressive stone landscape around the rock monasteries is often called a natural phenomenon as it is interesting how monolithic stone blocks have appeared at the site of a former ancient river delta. 60 million years ago during the Tertiary era, Thessaly plain was the bottom of a large lake, surrounded by mountains. Numerous mountain streams are flowing into the lake and alluvial material has gathered on their slopes. The waters of the lake were swollen to the sea as a result of a powerful natural disaster. Then, thanks to the mountain streams that flow soft sediments in are formed the needles of rock, called Meteora. Indeed, the seemingly monolithic rock formations are made of solidly welded round river stones with all sorts of sizes. The story tells how in the 11th century rock, the caves of Meteora were inhabited by Christian monks. Over time, God's servants begin construction of their temples, the monasteries gradually appearing in the natural rock fortifications. They can be reached by rope bridges, ladders and stairs that were carved in stone. In the past, the rock monasteries of Meteora were twenty-four, of which now only seven survive. Metamorfosis Sotiros, Megalo Meteora is the largest temple. It was founded in 1340 by St. Athanasius of Meteora. Today, into this monastery tourists are allowed in the summer - from 9:10 to 13:00 and from 15:20 to 18:00, except Tuesday, and in winter - from 9:00 to 13:00 and from 15:00 to 18 : 00, except Tuesday and Wednesday. The monastery "St. Nicholas Anapausa" dates from the first decade of the 14th century. Today the monastery ossuary keeps the skulls of deceased monks. This temple complex of Meteora is particularly beautiful with its frescoes and paintings of the Cretan painter Theophanous. Works are available to the public only summer. The monastery "Rusanu" was founded in 1529, on the ruins of an older building. For its founders are considered the monks brothers Joseph and Maxim from Ioannina. Today the monastery of Meteora is a convent, it is open to tourists both summer and winter. The church "St. Stephen" also functions as a convent. It was founded in 1192. The monastery "Holy Trinity" exists in Meteora since 1362. Today, visitors are admitted every day in summer and in winter, access is restricted on Thursday. The next monastery is "Barlaam" and it dates from 1517. Temple "Ipapandis" is one that is closed to the public. It was founded in 1347. Starting point for visiting the rock monasteries of Meteora are the Kalambaka and Kastraki settlements. Both have excellent facilities and are a good base to meet the thousands of tourists coming to see Meteora. There are numerous hotels, rentals, and places to go camping here. The entrance fee to Meteora is about two euros, you must be properly dressed to be admitted to the monastery.